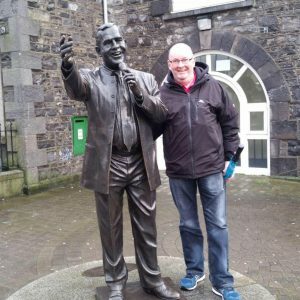 Irish Connection Radio Show – Bringing you the best in Irish County Music and more…(an MBM prodiction). Bringing you the best in Irish County Music and more…(an MBM prodiction). The Irish Connection Radio Show..
Sean Green is originally from Sligo, he started going to Irish Clubs at a very young age. Sean’s first input into Irish Country came when he played Drums with The Kingdom Show band for 3 Years. He then took the decision to become a professional DJ he has played support to the Bands such as Big Tom and many more. He started out on his long musical journey. playing at the Garryowen Club, Hammersmith w6. He currently Dj’s all around London, Ireland , Scotland. Sean green also known as “The Irish Connection” which is also the longstanding name of his radio show.. Welcome and feel free to contact me via the contact page..request a song!